Courtesy Propaganda Remix Project; all rights reserved.. Courtesy Ron English; all rights reserved. Go ahead, indulge yourself. Give in to the guilt-free nastiness of hating someone or something that richly deserves it. It’s one of life’s little pleasures. WordSpy.com calls it “hathos,” the journalist Alex Heard’s term for the giddy headrush we getequal parts hate and happiness, laced with pathos and bathosfrom hating things we love to hate. For conservatives, that means Janeane Garofalo, PETA, Michael Moore, the ACLU, scent-free “womyn-friendly spaces,” and group hugs. For liberals (whose godless legions include this writer), it means the Fratboy-in-Chief, “El Rushbo” (Limbaugh), the NRA, Anne Coulter, bible-belt troglodytes like the “10 Commandments Judge” Roy Moore (the Alabama Chief Justice who displayed God’s Laws in his courthouse, in defiance of federal law), meatheads who do that fist-pumping U.S. Marine “Huah!” thing and, always and everywhere, the SUV and other so-called “light trucks.” (The light-truck classification enables manufacturers to drive SUVs through a regulatory loophole, deftly evading fuel-economy regulations and many emissions rules). 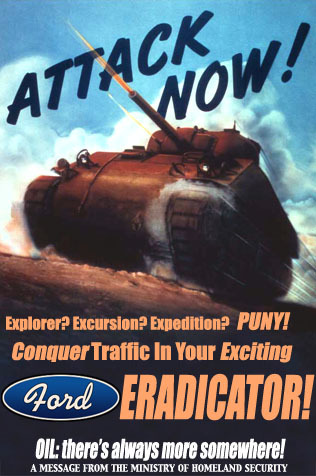 Sure, fulminating against SUVs, Hummers, and other members of the Axles of Evil is like shooting fish in a barrel. Still, for many, these four-wheeled behemoths are just too obvious a target to ignore. Satisfying, too: The pure, uncut hathos of a good Two Minutes Hate directed at SUVs and the people who love them is Crack Rock for the Liberal Soul. Tim Robbins, Earth First!, and the shoot-your-TV gang over at Adbusters magazine couldn’t have dreamed up a better bull’s-eye for greenie spleen. In such a supercharged atmosphere, people and things that catch the media eye often become semiotic attractors, accumulating meaning in the eyes of defenders and detractors alike. This is especially true of the car, a potent symbol in the American mind since the postwar economic boom of the ’50s, when easy credit made the dream of car ownership a reality for middle-class consumers. The Interstate Highway Act of 1956 helped midwife the birth of suburbia, giving us the Auto America we know and love. Of course, our veneration of the car as a household deity and our eagerness to raze whole neighborhoods (provided they were poor) in our alabaster cities and pave our fruited plains to make way for its asphalt temple, the highway, has earned us the blessings of smog, deforestation, and the cultural kudzu known as sprawl. Nonetheless, the American obsession with carsthe bigger and badder the bettercontinues, seemingly unchecked by soaring gas prices and a moribund economy. According to a May, 2004 USA Today story, SUVs accounted for 30 percent of the new vehicles sold in 2004, a 3 percent jump from 2003, and sales of the biggest SUVs climbed by more than 10 percent in the first four months of 2004. And why the hell not? Driving Detroit’s answer to a Tyrant Lizard from the Late Cretaceous is every American’s god-given right, goddamit, second only to the right to hunt deer with armor-piercing rounds or to make a mockery of Old Europe by repackaging her culture, American style. Triscuit® Bruschetta, anyone? Slim-Fast® Cappuccino Delight Shake? 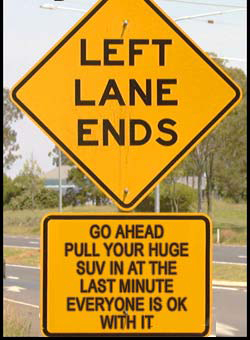 Now tell those cheese-eating surrender monkeys to get the hell out of the global fast lane, before they end up in The Road Kill Cookbook. Now, in post-traumatic America, where we live our lives on orange alert, we take our big cars seriously. If we are what we drive, big cars such as SUVs and Hummers are the embodiment of all that is right or wrong with this country, in the mass imagination. To its devotees, the SUV is a “safe room” on wheels, a bunker with beverage holders. “Sometimes the road ahead is paved with anything but good intentions,” warns an ad for the Jeep Grand Cherokeea tagline with an unintentionally (?) ominous subtext at a time when grotesque images of four American military contractors, dragged from their burning SUV and torn to pieces by exultant Iraqis in Fallujah, replay themselves in American nightmares. In his book High and MightySUVs: The World’s Most Dangerous Vehicles and How They Got That Way, Keith Bradsher quotes Clotaire Rapaille, a psychologist whose work with car-owner focus groups has led him to believe that the American fear of violent crime is an important factor in the psychology of big-car appeal: “People buy SUVs, he tells auto executives, because they are trying to look as menacing as possible to allay their fears of crime and other violence.” Marshall McLuhan’s observation, in Understanding Media (1964), that “the car has become the carapace, the protective and aggressive shell, of urban and suburban man,” is truer than ever in locked-down, wartime America. 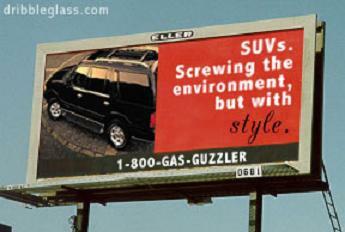 All phallic power on the outside, reassuringly womblike on the inside, SUVs are armored cocoons for an Age of Anxiety. Courtesy Propaganda Remix Project; all rights reserved. To some, though, the road ahead still looks like the “thoroughfare for freedom beat/ across the wilderness” evoked in “America the Beautiful.” In this light, that Jeep Liberty or that Ford Escape you’re driving is the incarnation of the pioneer spirit, the freethinking individualism that made this country great (or so the story goes). Screw the tree-huggers and their Al Gore-in-a-hairshirt jeremiads about hydrofluorocarbons! We’re revving up our Chevy Trailblazers and our Ford Explorers and our Nissan Pathfinders and we’re lighting out for the territories. And if we run out of road, we’ll make our own. For others, of course, monster trucks like the Hummer are rough beasts slouching, at 10 miles per gallon, toward Bethlehemposter cars for American Empire at its most nasty, brutish, and supersized. Bruno knows this better than most: He’s friends with the owner of Clippinger Chevrolet, the West Covina, California Hummer dealership that was fire-bombed in August, 2003 by the Earth Liberation Front, a decentralized group of guerrilla environmentalists who espouse guerrilla warfare. 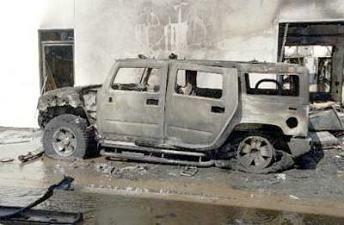 The inferno reduced 20 Hummer H2s to blackened carcasses and damaged another 20. Some of them flaunted mocking slogans, such as “I’m a greedy little pig” and “I love pollution” and “Fat lazy Americans.” Ironically, says Bruno, the toxic fumes belched out by the burning Hummers “was some ridiculous amount of times more than any of those cars ever would have made if they’d burned gas for 200,000 miles every day for the next five years,” an assertion more or less confirmed by West Covina Fire Chief Richard Greene, in an LA Weekly story about the attack. 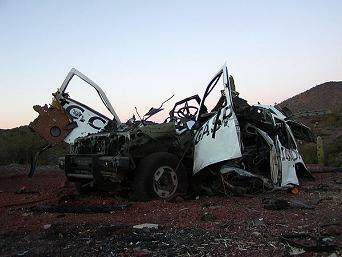 Fire-bombed SUV, Clippinger Chevrolet. AP photo. Obviously, torching 20 Hummers in defense of Mother Earth and unleashing 20 lifetimes’ worth of toxic spew in the process wins the Homer Simpson Hole-in-the-Forehead Award. Even so, the ELF’s ritual sacrifice of these battle-ready gas-guzzlers is just the Unabomber version of a riptide of rage that is churning beneath the surface of American society. A significant number of Americans is infuriated by what they see as the rogue-state lunacy of the war in Iraq and the crony capitalism and anti-environmentalism of an administration run, in their eyes, by draft-dodging hawks, corporate kleptocrats, and a president widely perceived to be dumb as a bag of hammers (“Nobody would ever enroll him in a quiz show,” conceded David Frum, Dubya’s former speechwriter). These are the people who look at the big, black SUV, its tinted windows inscrutable as Darth Vader’s faceplate, and see the hated symbol of an evil empire. They ponder its gas-hogging fuel inefficiency and reflect on the swinish selfishness of a nation that, as Bradsher notes in High and Mighty, “has 5 percent of the world’s population, but produces nearly a third of all greenhouse gases from automobiles.” They think about the my-way-or-the-highway arrogance inherent in SUV designthe way their Brontosaurian bulks cut off other drivers’ sightlines; the way their Xenon headlights flood the cabins of smaller cars, turning rear-view mirrors into eye-frying spotlights; the way their drivers can’t see the Camry they just forced off the road, exploding into a fireball, because they’ve got more blind spots than a glaucoma convention. 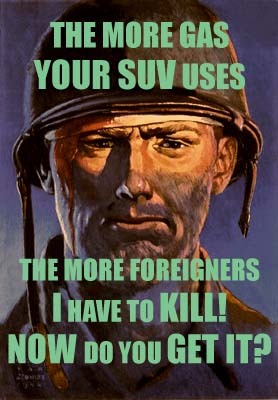 To some, the SUV is a living parable about the menace to global society posed by our go-it-alone “exceptionalism,” here in what Deputy Secretary of Defense Paul Wolfowitz likes to call the New American Century. They mull over the grim statistic that SUVs, because they ride high and typically have stiff fronts, without protective crumple zones, are nearly three times as likely as ordinary cars to kill the other driver in a crash, a fact that accounts for 1,000 needless deaths annually. Exploded SUV. Courtesy GasPig.com; all rights reserved. This was written by Mark Dery. Posted on Friday, October 28, 2005, at 12:03 pm. Filed under Floating Signifier, Rant. Bookmark the permalink. Follow comments here with the RSS feed. Comments are closed, but you can leave a trackback.